For other uses, see Crybaby. 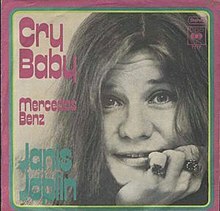 "Cry Baby" is a song originally recorded by Garnet Mimms and the Enchanters, in 1963, and later covered by rock singer Janis Joplin. Bert Berns wrote the song with Jerry Ragovoy. Garnet Mimms and the Enchanters recorded it for the United Artists record label. It topped the R&B chart and went to #4 on the Billboard Hot 100 chart in 1963, and paved the way for soul hits by Aretha Franklin and Otis Redding later in the decade. The third verse was spoken by Mimms until the repeated refrain of the repeated song title. In September and October 1970, Janis Joplin recorded it for her album Pearl, posthumously released in 1971. The song was in blues-rock style and its producer was Paul A. Rothchild. On the single, the B-side was the track, "Mercedes Benz". The song became usual in Joplin's repertoire and today is often performed by many artists such as Joss Stone, Allison Iraheta, Magdolna Rúzsa. ^ Whitburn, Joel (2004). Top R&B/Hip-Hop Singles: 1942-2004. Record Research. p. 403. ^ Steve Huey. "Garnet Mimms | Biography & History". AllMusic. Retrieved 2016-06-21. ^ Bruce Pollock Rock Song Index: The 7500 Most Important Songs . - 2014- Page 67 1135462968 "CRY BABY Artist: Garnet Mimms and the Enchanters Written by: Jerry Ragovoy (Norman Meade), Bert Berns (Bert Russell) From the album: Cry Baby and 11 Other Hits Label: United Artists Produced by: Jerry Ragovoy Year: 1963 #1 R&B/Top .."
This page was last edited on 9 December 2018, at 07:29 (UTC).